Sashes & Trophies & Titles, Oh my!!!! 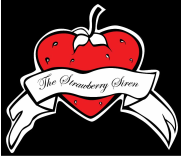 The Strawberry Siren has been awarded many different titles from many different competitions over the years. Please see below for all titles and nominations awarded to The Strawberry Siren, along with a shout out to all her fabulous sponsors! 21st century burlesque - burlesque top 50 2014! Top 10 Australian performers - voted no.10! Winner of "Most likely to take over the World"
21st Century Burlesque - burlesque top 50 2013! Top 10 australian performers - voted no. 3! MISS BURLESQUE AUSTRALIA 2013 - WINNER! Melbourne-based beauty, The Strawberry Siren has taken out the coveted title, Miss Burlesque Australia 2013, after a fierce competition where the best of the best this country has to offer came together on the one stage at Melbourne’s Athenaeum Theatre, each burlesque artist hoping to win the crown. The divine redhead knocked her peers out of the park, with her flawless performances, magnificent costumes and her creative use of impressive props, including a giant flower, in a routine that needs to be seen to be believed! - Most likely to sneak backstage. - Most likely to take over the world!